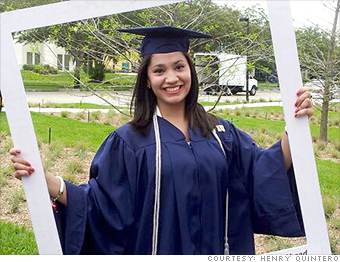 These seven recent college grads bucked employment trends and landed great jobs after graduation. Here's how they did it. Current job: Chrysler Institute Engineer in Auburn Hills, Mich.
How I got my job: I would go to career fairs and conferences organized by the Society of Hispanic Professional Engineers. With the help of SHEP, I was able to get an internship at Toyota. The internship lasted eight months, and I was in the electronic systems department. After the internship, I went to a STEM conference and interviewed with Chrysler. They flew me out to Michigan for another interview on a Friday. A few days later, I received an offer. It was a dream come true. The program will let me work full-time at Chrysler's headquarters while earning a master's degree in electrical engineering. Chrysler will also pay my full tuition, as long as I keep my grades and GPA up. Advice for current students and recent grads: Join organizations that get you out there. Once you do that, you will have many more options to get an internship.